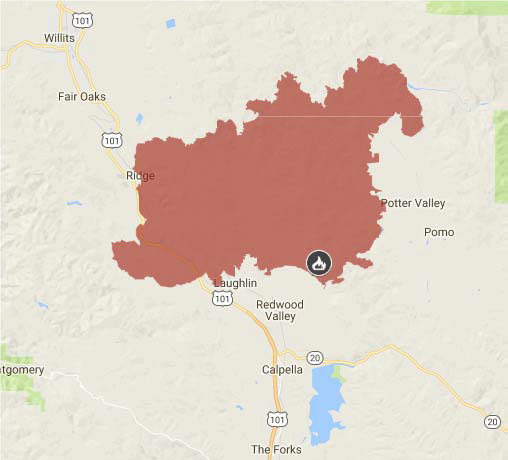 The Redwood Complex Fire, which started on October 8, 2017, was the result of two fires merging — the Potter Valley and Redwood Valley fires. The Potter Valley fire started at approximately 10:35 p.m. in northwest Mendocino County and joined a second fire that ignited at approximately 1:30 a.m. on October 9. Because of the steep terrain, fuel moistures, and northwest winds the fire blazed for 21 days and was not fully contained until October 28, 2017. Unfortunately, the consequences of the fire have been devastating for Mendocino County neighborhoods and business districts. Most tragic, the fire has caused the loss of life and serious injuries. To date, nine deaths have been reported, ranging in age from 14 to 88. Additionally, more than 20 individuals have been hospitalized with severe burns. Below is a map showing the far-reaching scope of the fire and communities is has impacted. Additional information from CAL FIRE can be found here. An investigation into the cause of the Redwood Complex Fire is currently ongoing, including the involvement of PG&E. The utility company’s maintenance and inspection practices of its power infrastructure and electrical poles will be heavily scrutinized. CAL FIRE has taken possession of tree limbs and damaged electrical equipment as part of its investigation. Last year, a CAL FIRE investigation found PG&E responsible for the 2015 Butte fire, which destroyed 549 homes and killed two people. That fire was sparked by an unmaintained tree that fell onto a power line near the Amador County community of Jackson. Similarities between the Butte Fire and Redwood Complex Fire are apparent. The Mendocino County Sheriff’s Office noted reports of downed trees and power lines near the origin of the fire on Hawn Creek Road in Potter Valley at approximately 10:30 p.m. shortly before the fire commenced. Further, after the fire commenced, large spans of PG&E lines were reported down, active and sparking. Since the devastating Northern California wildfires, the California Public Utilities Commission’s investigation of PG&E has uncovered at least eight instances in which unmaintained trees or tree limbs brought down power lines at the time these fires ignited, including in Potter Valley. Since the Redwood Complex Fire was extinguished, the surrounding area was evaluated by Watershed Emergency Response Team, a group of geologists, engineers, hydrologists and foresters to evaluate any hazards to life and safety of persons in the area. WERT found potential for increased stream flows, increased erosion and sediment delivery, and debris flow occurrence. It also raised concern that people residing or traveling within the mapped floodplain or downslope of a potential mudslides move to a safe area before, during and after high intensity rainfall. The full WERT report can be found here. Further, if you’ve been impacted by the Redwood Complex Fire, document all of your expenses since the fire, including medical bills, lodging and all additional costs incurred due to relocation. Track all damage to real property and personal property through a diary and photographs. If you have not yet contacted your insurance company, do so as soon as possible. For a free consultation or if you have any questions, we welcome your call to this office.